Let your child choose a favorite story and act it out. Pick out just one small section of the story, if your child is young. You can do several sections with older children. You can have neighbors join in, or you can each play different parts. 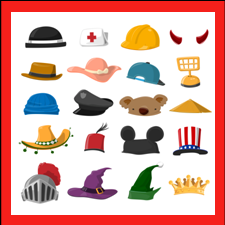 Make up costumes from things you have around the house – just different hats can work, if that’s all you have. If you are playing more than one part, having a different hat for each part can help you switch from one to another. Perform the “play” for your family or neighbors. Be as fancy as you like – with tickets, refreshments, etc. A reminder that preschool-aged children test out what it means to be mean, but you can help them learn that there are good reasons to give up being mean to be nice. A reminder that the first days of school can be scary for your children at any age and that you can help them get over those fears. A reminder that all children have trouble sharing, but you can help them learn that it also can be fun to share. This entry was posted in Activities and tagged make-believe. Bookmark the permalink.